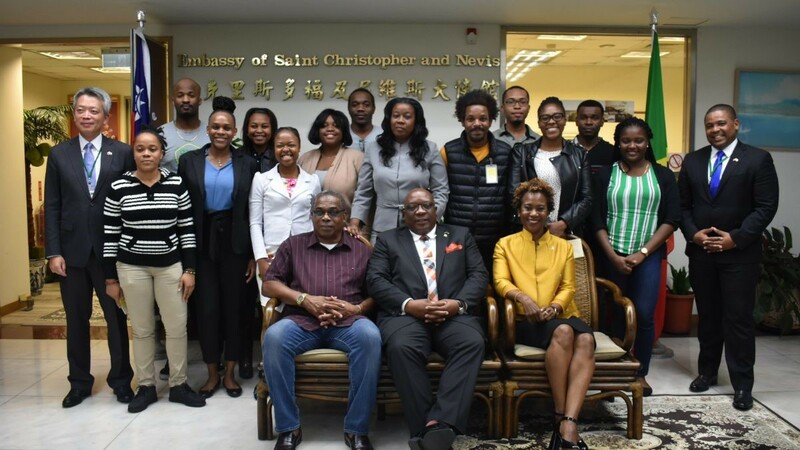 Prime Mjnister Dr. the Honourable Timothy Harris and members of the SKN delegation pictured with nationals of St. Kitts and Nevis who are studying in Taiwan. Prime Minister Harris with Journalism student, Mr. Kemarri Armstrong. 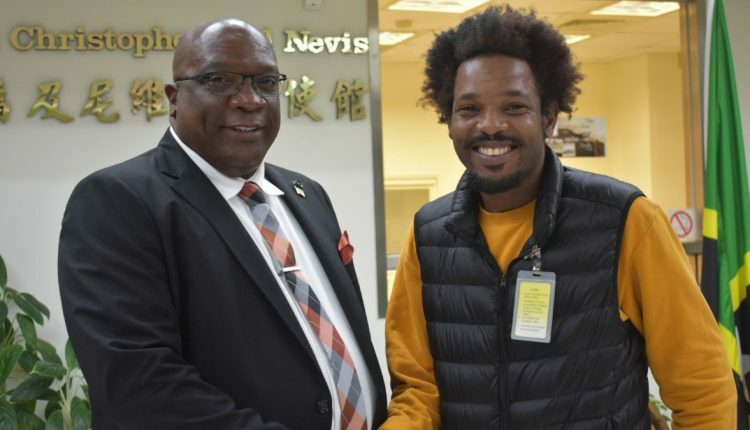 TAIPEI CITY, Taiwan, April 17, 2019 (Press Unit in the Office of the Prime Minister) – Several nationals of St. Kitts and Nevis who are currently furthering their education at various universities in the Republic of China (Taiwan) have expressed their appreciation to Prime Minister Dr. the Honourable Timothy Harris and his Team Unity administration for their work in strengthening the ties between the twin island Federation and Taiwan, which has led to even more nationals being afforded the opportunity to pursue their goals of attaining higher education through scholarships. On Tuesday, April 16, Prime Minister Harris met with a group of Kittitian and Nevisian students at the St. Kitts and Nevis Embassy in Taiwan as part of his official visit to the allied country. The prime minister was accompanied by Minister of Public Infrastructure et al., the Honourable Ian Patches Liburd; St. Kitts and Nevis Ambassador to the Republic of China (Taiwan), H.E Jasmine Huggins; Permanent Secretary in the Office of the Prime Minister, Mr. Andrew Skerritt, and other members of the St. Kitts-Nevis delegation. The meeting with students came on the heels of the ceremony at the Presidential Office Plaza where Dr. Harris was conferred The Order of Propitious Clouds with Special Grand Cordon by the President of the Republic of China (Taiwan), Her Excellency Dr. Tsai Ing-wen, for his work in fostering stronger ties between both countries. Journalism/Mass Communication student, Mr. Kemarri Armstrong, commended Prime Minister Harris on his achievement. Ms. Karen Annette Crawford, who is pursuing her Masters in Nursing/Midwifery, stated that while she had to make certain sacrifices, she has no regrets with her decision to pursue higher education in Taiwan. “I always thank the Taiwan ICDF (International Cooperation and Development Fund) and the Government of St. Kitts and Nevis for this opportunity and I just wished more nurses in St. Kitts and Nevis would take this opportunity…because the health system would benefit from it,” Ms. Crawford said. Prime Minister Harris in turn urged the students to do their best and return home to help improve the human capital resource in St. Kitts and Nevis. Dr. Harris also used the opportunity to update the students, some of whom have been studying abroad for 3-5 years, of the many positive developments currently taking place back home in St. Kitts and Nevis including the roll out of the massive island main road rehabilitation project, the construction of the second cruise pier and the commencement of work on the Old Road Bay Road. 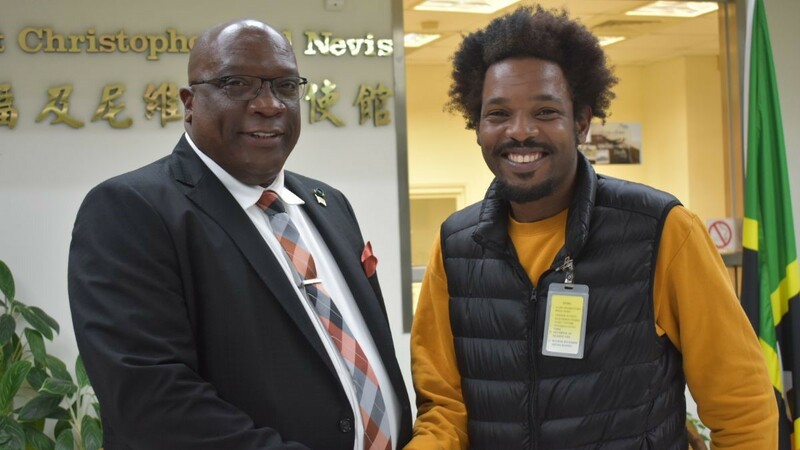 Scholarships are offered to Kittitians and Nevisians to study at Taiwan universities through the Ministry of Foreign Affairs (MOFA) Taiwan Scholarship programme as well as through the Taiwan ICDF International Higher Education Scholarship Programme.